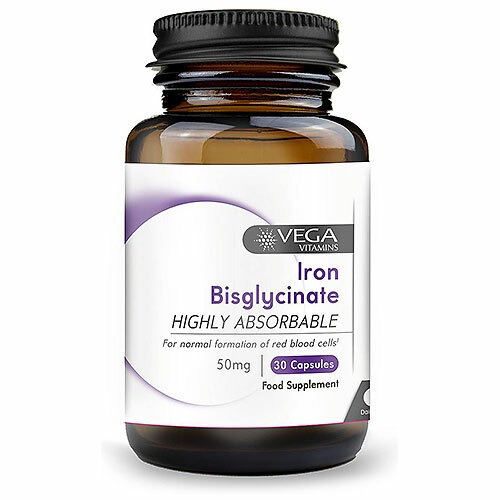 Iron bisglycinate is a highly bio-available amino acid chelate. Iron is an essential mineral required in the body for the production of haemoglobin and myoglobin. Haemoglobin is a pigment found in red blood cells, which is responsible for carrying oxygen to every living cell in the body. Myoglobin is the red pigment found in muscle cells and helps in the storage of oxygen in muscles. Pregnant and menstruating women, the elderly, athletes, adolescents, vegetarians and vegans may have an increased dietary requirement for iron. Adults: Take 1 capsule daily with food or as directed by a healthcare professional. May cause mild stomach upset in sensitive individuals. Below are reviews of Vega Vitamins Iron Bisglycinate - 30 x 50mg Capsules by bodykind customers. If you have tried this product we'd love to hear what you think so please leave a review. Works well at increasing iron levels. Doesn't constipate or cause stomach upset.